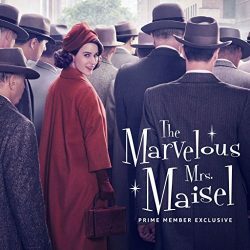 Returning to Amazon this Winter, The Marvelous Mrs. Maisel continues to captivate its audience with a nostalgic soundtrack that seamlessly plays through the life of Midge Maisel. The series takes place in 1950s New York City where Maisel seems to live a perfect life as doting housewife to her not-so-funny wannabe comedian husband. When the rug gets completely pulled from underneath her (no spoilers) Maisel rises to the occasion and decides to pursue a newly found talent in stand-up comedy. This year the series took home an Emmy for Outstanding Music Supervision in a television series. Music supervisor Robin Urdang collaborated with Executive Producers and show creators Amy Sherman-Palladino and Dan Palladino to curate the soundtrack that transports you back in time. In the beginning of the season Urdang’s selections perfectly connect the hustle and bustle of NYC and the happiness and content that Maisel felt in day-to-day life as a 50s housewife. However as we get further into the series, the music becomes more unexpected and offbeat as Maisel navigates her new life and career as a stand-up comedian. The Orchard secured a placement in season one episode four when Maisel decides to visit a local record store to sift through some live recordings of famous stand-up routines. She stumbles across a record by Redd Foxx, a raunchy stand-up comedian known for his explicit language. An excerpt of Redd Foxx’s routine “The Nut and the Flat Tire” (Cleopatra Records) plays while Maisel giggles in her childhood bedroom — taking pointers for her next routine.